Global equity markets ended the first quarter of 2018 much differently than where they began. What started as a continuation of 2017’s rally, with the S&P 500 increasing more than 5% based on optimism for continued global expansion and increased earnings from favorable year-end tax legislation, reversed quickly in early February. Stocks tumbled into correction territory hurt by rising interest rate concerns, and failed bets on volatility remaining low. Most experts had predicted an end to the complacent markets of 2017, but few expected the magnitude of over a 1,100 point drop in the Dow in such a short period of time. This jolt served as a reminder that in the framework of bull markets, it’s standard to have pullbacks before stocks advance higher. Ironically, the decline came as a relief for some veteran investors, as it is more emblematic of healthy functioning markets. Later in the month, inflation readings and wage growth were revised lower and equities recovered. However, the uptick was short lived, only to be undone again by trade war concerns between the U.S. and major trading partners, including Canada, Mexico and China. Also, continued growth in technology stock earnings came under scrutiny as revelations of consumer data manipulation surfaced, and the likelihood of reduced earnings due to increased privacy regulation was considered. Technology is a top constituent of the S&P 500, with Apple, Microsoft, Alphabet, Amazon and Facebook now dominating the index. Price movements amongst the group can and did have dramatic effects on the fluctuation on the S&P 500/Dow Jones Industrial Average. 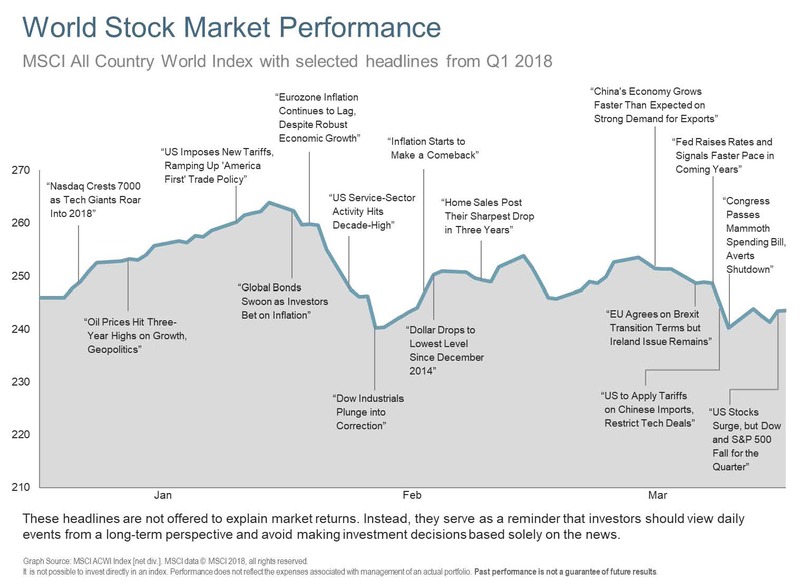 Equity markets across the globe, like the U.S., turned negative as well, with the emerging countries market providing the only positive return for the quarter. In contrast to equities, due to the same concerns mentioned above, the U.S. Bond market started the year with declining prices and rising yields. The 10-year treasury yield reached a four-year peak at 2.943% on Feb 21st. This was the largest quarterly increase since December 2016. Short-term rates also appreciated in anticipation of the Federal Reserve raising rates throughout 2018, which transpired at the March meeting. It was the sixth increase since 2015, with a forecast of two more increases in 2018, and increased rate projections for 2019-2020. The new upward revisions were most likely prompted by anticipated stimulus of the $1.5 trillion tax cut and increased government spending under the recently passed budget. In March, after strong January wage data was revised lower and inflation data came in below expectations, the rise in longer term rates stalled. Bonds also attracted buyers as rising yields attracted potential stock market investors, pushing up prices. The 10-year treasury yield declined and is currently at 2.85%. As we’ve mentioned in the past, a flattening yield curve and the decreasing spread between short and long-term rates can be a sign of a slowing economy. However, most believe it’s a result of the Federal Reserve’s actions to reverse the liquidity stimulus put in place during the financial crisis. Views on future inflation are still being debated by participants, with some claiming new technology will promote increased productivity, and a declining population will keep inflation growth at a moderate pace. Other analysts feel the Federal Reserve will have to react more quickly, increasing interest rates in response to a healthy economy and an enormous amount of cash still in circulation. Yields on bonds will continue to react to these two different viewpoints as economic data continues to be released. Oil prices along with gold increased for the quarter, however REITs, Infrastructure-themed investments and Commodities declined as trade spat rhetoric intensified at the end of the quarter. Looking ahead and despite the market concerns as mentioned above, the economic data and underlying fundamentals of the global economy are still strong. Corporate earnings among S&P 500 firms are projected to show growth of 17% from the year-earlier period, according to FactSet. Business confidence shown by record merger and acquisition deals has hit unprecedented highs. Additionally, unemployment continues to improve, leading indicators continue to rise, and manufacturing growth data hit a new high. Although the market has recently focused on repercussions of the trade war, it is unclear whether or not this is indicative of negotiating tactics rather than a growing threat. 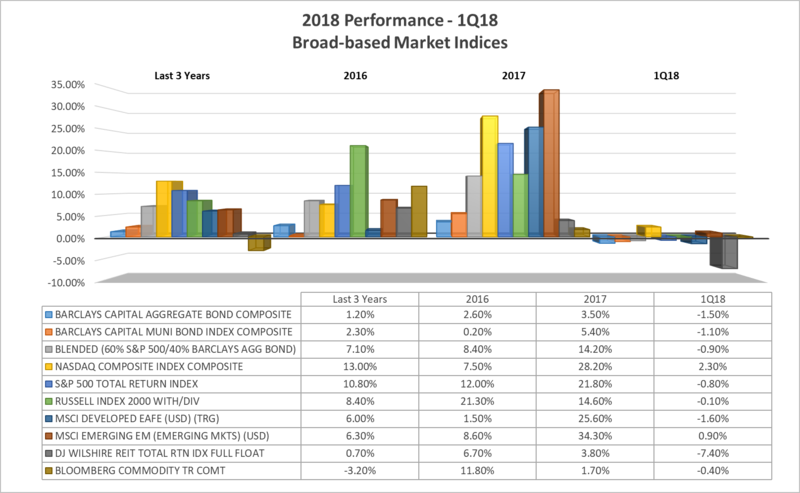 Analysts are not projecting a recurrence of last year’s double digit returns, yet the likelihood of a slowdown or recession is not on the horizon either. We continue to recommend a diversified approach with global stocks, bonds and income investments. As always, we welcome a conversation about how this affects you and your family’s financial plan.